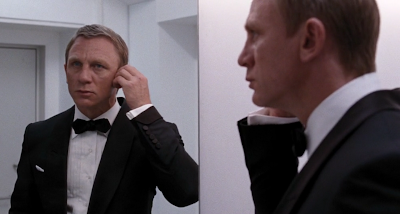 In Quantum of Solace, Bond found in a locker a perfectly-fitted dinner suit that was almost a copy of Bond’s first dinner suit that Sean Connery wore to introduce the character in Dr. No. The Tom Ford dinner jacket is a midnight blue button one, shawl collar model, which Bond hasn’t worn since The Living Daylights. The jacket has jetted pockets and double vents, and even the gauntlet cuffs (now with five buttons instead of four) have been retained. The shawl collar, cuffs, pocket jettings, button coverings and trouser stripe are black silk, slightly contrasting with the luxurious midnight blue mohair-cashmere tonic. The shirt and tie are also copies of Connery’s clothes. The shirt has a spread collar, double cuffs and a pleated front, but with mother of pearl studs instead of buttons. The bow-tie is the same diamond-end style as Connery’s, except it’s in a wider batwing style to better harmonise with the lapel width. Craig also includes a folded white linen pocket handkerchief. His shoes are black calf oxfords, not patent leather. This black tie ensemble has a few differences from the one in Dr. No. The biggest difference is the trousers, which have a low rise and a flat front here whilst the trousers in Dr. No have double forward pleats with a longer rise. 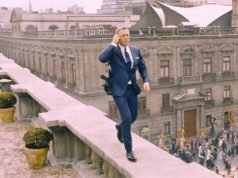 The trousers in Dr. No also have button-tab waist-adjusters, whilst these most likely have the same buckle side-adjusters as the the other suits in Quantum of Solace. Another significant difference is the waist-covering. Craig wears a cummerbund while Connery breaks black tie protocol and goes without any waist-covering. Some smaller differences include the addition of a buttonhole in the left lapel. The cut and proportions of this dinner suit also differ from Connery’s. Following current trends, this dinner jacket has a trimmer cut, narrower shoulders and a higher button stance. Still, none of that is to the extreme and this dinner suit will still look good in years to come. As long as there are two vents on a dinner jacket rather than one it's alright. Even Connery wore a vented dinner jacket. Apart from that I think this suit looks outstanding. 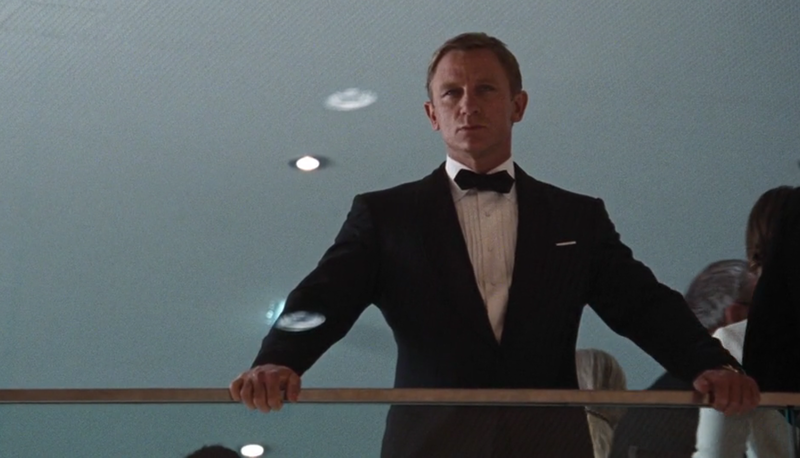 Just kidding, what was all this fuss about having a tailored dinner jacket in Casino Royale when a stolen literally off the peg suit fits that well !? The gag of the magically fitting suit is one of the few good laughs of the otherwise serious movie. And it is a nice reference to the Dr No dinner jacket and a nice suit. I agree with Kyle – this is an outstanding dinner suit (as was Craig's in Casino Royale). I too am conflicted, however, about vents on a dinner jacket. I have tried to avoid matters outside the clothes, but I must agree that Quantum has a sloppy narrative (apparently intended as an homage to Chinatown), and some of the action is too over-the-top. That said, I have to give it props for actually trying to be about something – Bond's coming to terms with and accepting (seeking a measure of consolation and humanity, or a quantum of solace over) Vesper's actions. "A" for effort, acting, and the usual production values. "C" for writing – Purvis & Wade's are at fault no doubt, based on their track record (Casino Royale is the outlier). It makes me wonder whether it is actually midnight blue or black? Pete, in some shots there is a clear difference between the black silk trim and midnight blue body. It sometimes looks more blue than midnight. A very nice dinner jacket. I have no problem with the vents, locks really good to me. But, I do have some issue with the shoes. Black patent is always to prefer rather than basic Oxfords. What do Matt and Co. think about this? Patent leather plain-toe oxfords are preferable for black tie. I think regular plain toe or cap-toe oxfords are okay, but if these are the same oxfords Craig wears with his suits in the film they have a perforated cap toe, which doesn't work so well for evening wear. What about the suitability of black loafers/slip on shoes with evening wear? The only traditional shoes for black tie are patent leather oxfords and patent leather court shoes. One could argue that plain-toe slip-ons are similar to court shoes and therefore acceptable. As long as the shoe is patent leather and has a plain toe I think it's okay for black tie. Just as long as Bond doesn't wear those formal patent leather pumps with the little bows on them! I didn't see the cummerbund. With the jacket closed the cummerbund shouldn't be easy to see. If it weren't for behind the scenes pictures I wouldn't know it was there. Anyone know where I can purchase a similar diamond end bow-tie? I have a grosgrain thistle diamond-end bow tie from Polo Ralph Lauren. 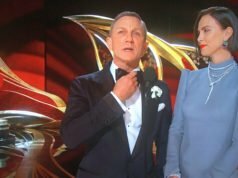 I only saw the movie once and noticed the cummerbund, namely because it's one of the few times any Bond actor has worn one. One could argue that he kept his own black shoes since the performer's didn't fit him. But it doesn't explain why everything else (improbably) fits him perfectly. What a fortunate coincidence that this guy happened to have the exact same measurements as Bond! What happened to the article about the Dr. No Dinner Jacket? I couldn’t find it anywhere on this site. Could you repost it if it is gone? Or give me the link to where it is. Hi. I’m not sure why my comment was not displayed, but I would like to know if you would recommend me this suit for my wedding. I’d love to use it, but I’m not sure because it’s a “dinner suit”. Sorry Rolando, I don’t know what happened to your first comment. A dinner suit is the English term for what Americans call a Tuxedo. I’ll answer you further in response to your email. It doesn’t matter what kind of pocket square one wears with a dinner suit. Brosnan wore a silk pocket square whilst Connery and Craig wore linen. Silk pocket squares typically aren’t crisply folded like linen pocket squares, as this one is folded. Matt, does the tuxedo not have the same concave shoulders that the rest of the QoS suits have? It has the same shoulders. Matt, are the lapels of this dinner suit of the same width as Connery’s Dr No dinner jacket, except with less belly perhaps ? It’s hard to see the shape of them because of their black facing. These look a little wider than the lapels in Dr. No. But it’s also difficult to compare since the shape is much different. This suit wasn’t a midnight blue mohair tonic fabric. It was a 50/50 cashmere mohair fabric in black from Taylor and Lodge, that used to be purchasable from their web site, but that option seems to be gone. After scrolling through the comments it seems another commenter has also picked up on this discrepancy. You might want to update the article. I don’t believe there was ever a discrepancy in my article. I’ve seen all kinds of mohair blends referred to as “tonic”, including mohair-cashmere blends. However, this dinner suit is midnight blue and not black as this article says. I’ve seen this suit in person, and it is definitely midnight blue. 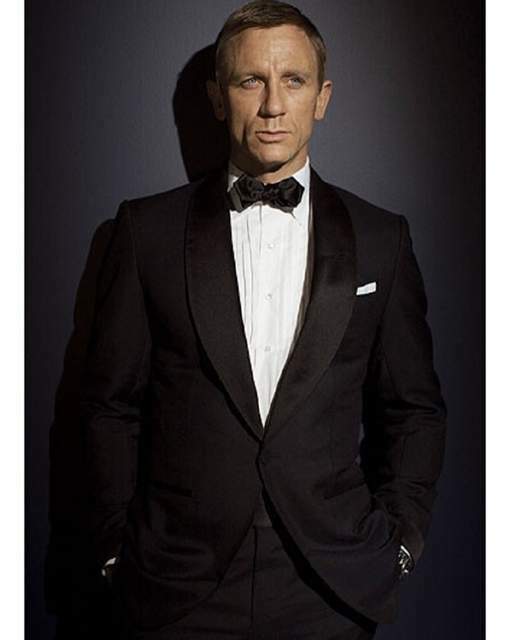 A number of articles on the clothes of Quantum of Solace had also called this dinner suit midnight blue. Out of all the dinner suits Daniel Craig’s Bond wore, this is my favourite. However, I was wondering though if this particular dinner jacket had pick stitching on it. What’s your position on this? Should dinner jackets include pick stitching on them? I don’t believe it has pick stitching on the lapels. I don’t think that lapels with facings should have pick stitching, and it’s not usually done. But overall, it’s a matter of taste. I have a question for you, and i hope i chose the correct article for it. Might it draw your attention to a further scene in the movie, where Bond is spotted by Greene and there is a gunfight that follows? In that scene, you will remember there being a character who was a member of Special Branch, the one whom Bond threw off a roof and who got shot dead by one of Greene’s henchmen when he fell on the bonnet of Greene’s car? I rather liked his suit and in particular, his tie. Although his role in the film is brief, could you throw some light on his outfit? Yes, that’s the same suit that he wears in the film. 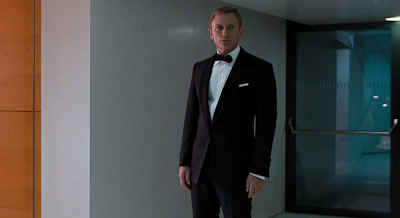 Matt – do you know the differences between this dinner suit and the one Craig wears in Skyfall? Both are magnificent in my opinion. The material is different, the collar is shaped differently and one has a buttonhole in the collar, one has gauntlet cuffs with more buttons on the cuffs, and the cuts and fits are very different. Thank you! They are both among my favorite Bond dinner suits since the Brosnan era.